If you're not familiar with Doom Jazz but enjoy the music of Angelo Badalamenti and David Lynch, you're in for a treat. Since 1992 this German quartet has been creating what I refer to as a demonic extension of the music for Twin Peaks. Also present is the influence of Barry Adamson's work on the "Lost Highway" soundtrack. Thanks to Mike Patton for re-issuing this on his Ipecac label in 2004. Its the Bad Angel on Codeine. I love this band. They describe themselves as "an unholy mixture of slow jazz ballads, Black Sabbath Doom and down-tuned Autopsy sounds". 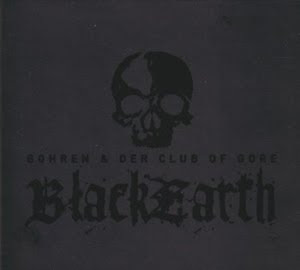 They've released a handful of albums through the years but "Black Earth" is their finest work. They work with traditional jazz instrumentation (minimal brushwork and sizzle cymbal on the drum kit, subtle upright bass, sparse piano, fender rhodes and breathy haunting saxophone); but eerier than you could imagine is the very creative and ghostly input of the mellotron. I'm also impressed with the way this album is mixed. I like the levels but be careful with your subwoofers when you throw this one on. This truly is Jazz for Doom Metalheads.